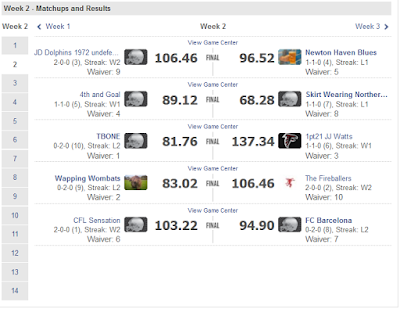 Well week two was predicted to be a close-run affair and so it turned out to be with one position making all the difference in the final result. The ever reliable Derek Carr vastly outperformed Jameis Winston who imploded after Doug Martin left the game with a hamstring injury. Tyrod Taylor bounced back for the Bills in week 2, but he was deemed only worthy of a bench spot which proved costly for the Newton Haven Blues. Victory for the Dolphins was confirmed by Alshon Jeffery on Monday night, although the Bears did go on to lose that game. Derek Carr continues his strong start to the 2016 season. 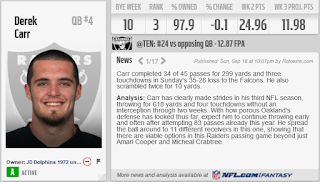 Averaging over 20 points a game, Carr took great strides in the TD category throwing three while continuing to avoid an INT. There was a drop off in passing yards but with Oakland's strong O-Line we can expect his strong performances to continue. DeMarco Murray slowed a bit in week two but still put on a reasonable performance. 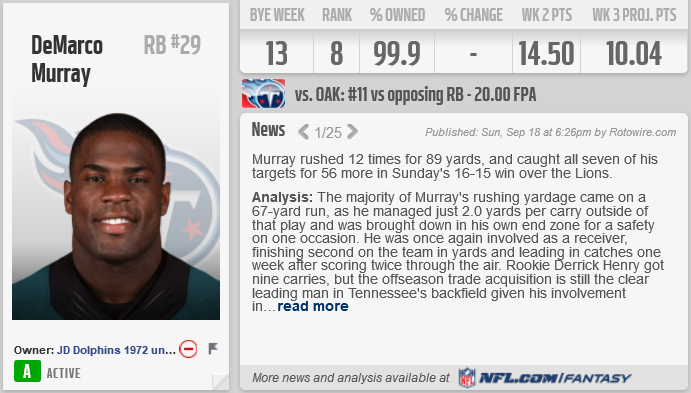 Currently ranked as the 8th best RB in the league expect him to move up the standings with the high number of injuries to RBs this week. On the subject of RB injuries, Doug Martin going down with a hamstring injury early in the TB vs Arizona game proved costly to both the Dolphins, in the fantasy matchup, and the Bucs in the actual NFL. It is unlikely to be a coincidence that their gameplan fell apart when the star of their backfield went off injured. Now out for around 3 weeks it will be interesting to see how Charles Sims picks up the workload after managing a meagre 24 yards on 9 carries against Arizona in the absence of Martin. Newton Haven Blues vastly outperformed the Dolphins in the WR bracket, Kelvin Benjamin and Jarvis Landry both putting up over 100 yards receiving. 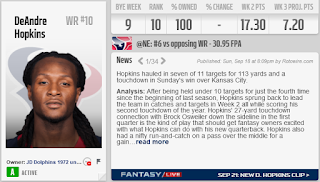 Benjamin also added two TDs to his week 1 score, while on the Dolphins side of the ball Hopkins scored 1 TD and had another questionably chalked off (his knee was clearly down before he touched the sideline, what game were you watching refs?!?!?!) while Alshon Jeffery is still looking for his first TD of the year. That search is unlikely to get any easier with an injury to Jay Cutler's throwing hand although it may be time for the Bears to starting looking for a signal caller of the future as Cutler continues to regress. 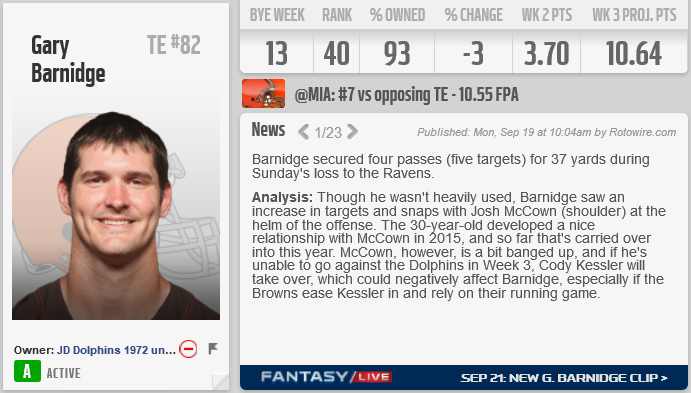 It may be time for the Dolphins to move on from Gary Barnidge. Cleveland stormed out to a 20 point lead against Baltimore before giving up 25 points without reply. The most concerning thing here is that as Cleveland cycled through plans B to Z Barnidge never seemed to enter the mind of Hue Jackson. After a stellar season last year the big bodied target should have provided a simple outlet to, now injured, backup QB Josh McC(l)own but instead he only had 5 targets and 3 receptions. In stark contrast to some of the more successful teams in the NFL Hue Jackson appears to be ignoring the TE position in gameplans and with 3rd string rookie Cody Kessler starting next week at the Miami Dolphins Barnidge is likely to see even less action. 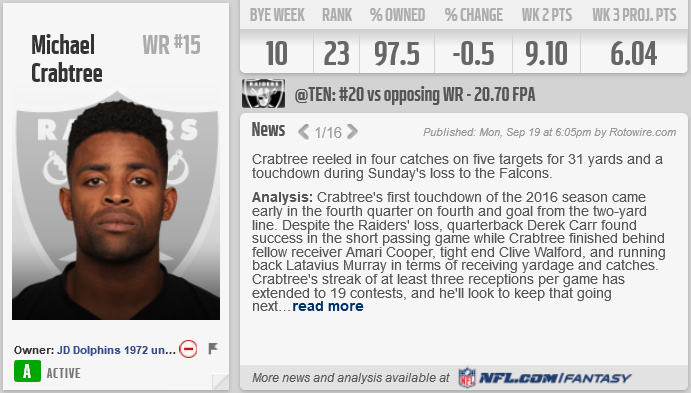 Michael Crabtree was once again underwhelming with Derek Carr spreading the ball out amongst the Oakland receivers. This week he caught a TD, but only managed 31 yards receiving on four catches (five targets). The short passing game is working well in Oakland but it would be nice to see Crabtree break out some big gains against Tennessee next week after finishing behind Walford, Cooper and Murray in catches and receiving yards against Atlanta. For the Blues DeAngelo Williams destroyed the Bengals, and he is currently the number 1 fantasy RB in the NFL. Cairo Santos came to the party this week and blew everyone away. He opened his account early with a long 50+ yard field goal before Houston stymied the Kansa City offence for most of the game. 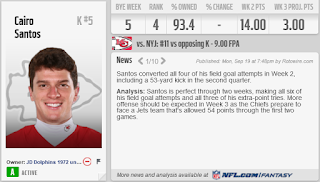 As the game wound down he added 3 more FGs but it wasn't enough to win KC the game. This was the LA Defence that we expected to see this season. Yes Russell Wilson was injured, and yes Rawls and Baldwin left the game but the intensity and drive of this defence silenced the Seahawks who have struggled offensively for the first two weeks of the season. LA looked back to their best here and against a weakened Bucs side they should be expected to do well again this coming week. The points wasted here by both sides could have been difference makers in another game. Travis Benjamin teamed up with Phillip Rivers to destroy Jacksonville and against a decimated Indianapolis secondary this week you should expect the pair of them to combine for some nice fantasy points again. Devonta Freeman looks like he is getting back to his best, although he did share duties with Coleman and this was against an Oakland Defence that has given up 30+ points in both of it's games this season. If Oakland are to make something of this season then their defence need to get themselves sorted out in a hurry. Justin Forsett vastly under performed as the self appointed RB1 in Baltimore. Cleveland were their for the taking and he only managed a combined 46 yards, expect him to lose the starting job in the coming weeks as the Running Back by Committee system in Baltimore finds a new figurehead. Andy Dalton had another decent week for the Bengals and he nearly lead a fourth quarter comeback against the Steelers. 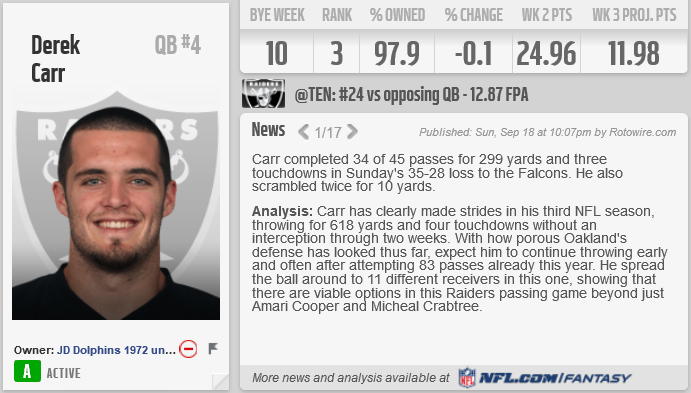 With the Broncos up next he may struggle a bit but he is a decent QB2 option in any league. Jordan Matthews continues to build rapport with Carson Wentz in Philly with 71 yards receiving. The Steelers coming to town should prove to be the next step up in challenge level for the rookie QB but he does appear to be taking everything in stride so far. 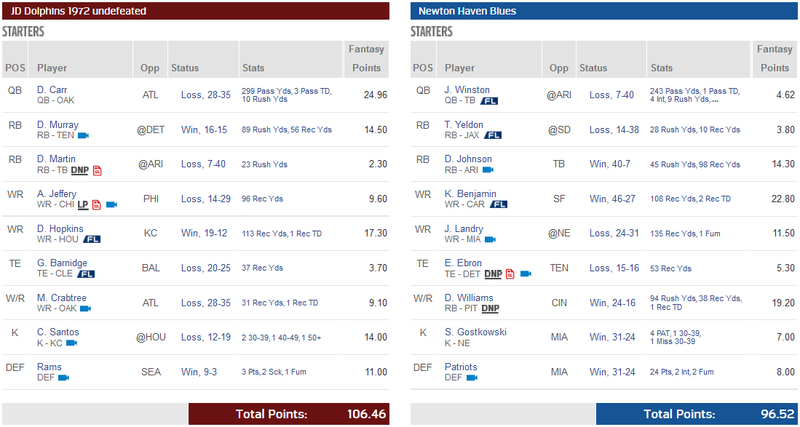 On the Newton Haven Blues side of things, there were two potential difference makers that were left out. Tyrod Taylor had a great game against the Jets and this was magnified by how badly Winston under performed as the starter. Additionally, Lamar Miller lost his place in the starting lineup to T.J. Yeldon, once again Yeldon failed to generate a lot of yardage for the Jags but this week he was unable to inflate his fantasy points with a TD. With Ivory working his way back into practice this could be seen as an opportunity missed for Yeldon who could have created a bigger role for himself for the season ahead if he had taken advantage of being "The Guy" these past two weeks, maybe he will get one more shot at it in week 3. One of only three teams that remain undefeated through two weeks the Dolphins have moved up two spots into third. 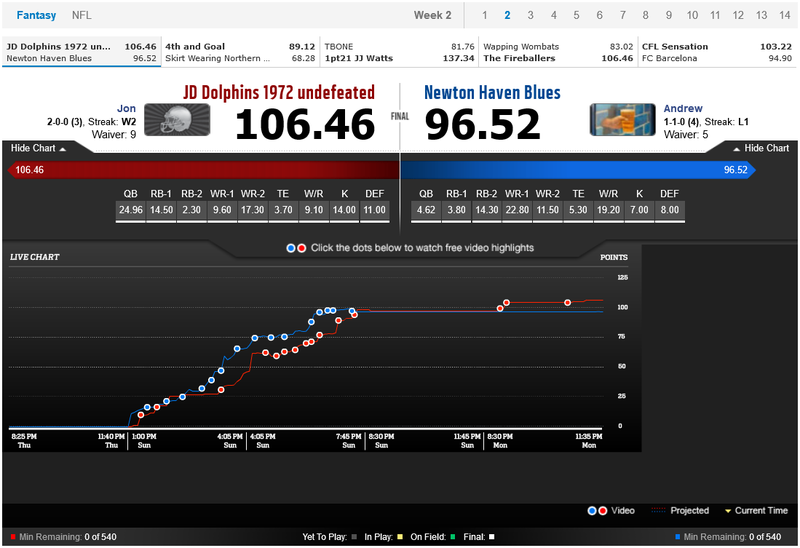 Week 3 will prove to be their toughest test so far as they come up against the top scorers in week 2, 1pt21 JJ Watts. Newton Haven Blues remain in fourth despite their defeat with 4th and Goal making the biggest strides forward, jumping up three places. In comparison Skirt Wearing Northern Folks have dropped 5 places down to seventh. 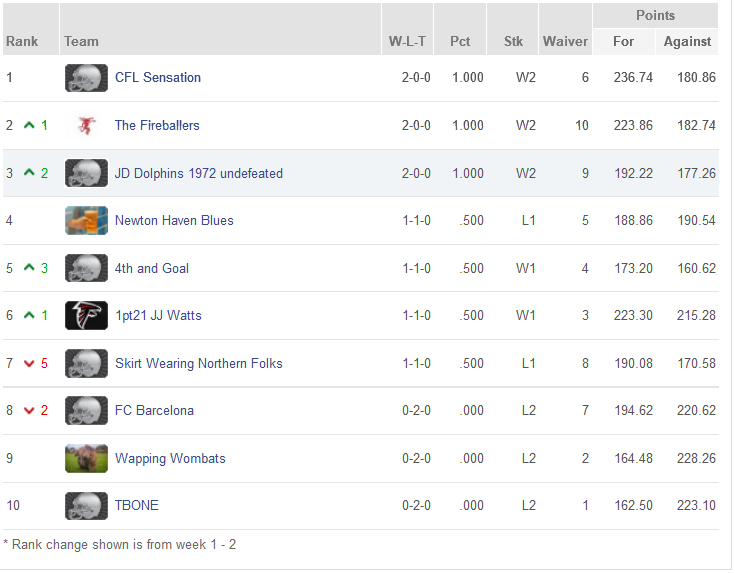 TBONE and FC Barcelona face off against each other in week 3 which means we should have at least one less team without a victory. 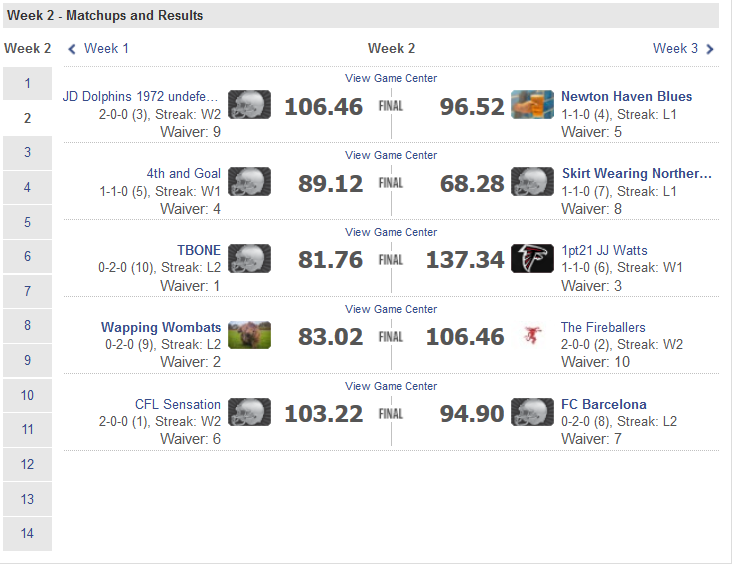 The Wapping Wombats face the biggest game of the week as they take on CFL Sensation.